Back row, L-R: 250/4, 90-230/4.5, 300/5.5, 200/3.5. Middle: 135/2.8, 55-135/3.5, TX 80-200/4, 135/3.5, 105/2.8. Front row: 35/2.8, 24/2.8, 21/3.8, 28/2.8. Not pictured: 400/6.3 and 75-260/4.5. Back in the 1960s and 70s, two photographic equipment importers waged a polite battle of ads in the photography magazines. Allied Impex Corporation and Ponder & Best imported highly competitive lines of cameras, lenses and accessories. Allied Impex brought us Miranda cameras and Soligor lenses. From Ponder and Best came the Mamiya /Sekor cameras and Vivitar lenses. In the early 1970s, sharp-eyed enthusiasts began to notice an odd occurrence. A.I.C. and P&B were importing competing, nearly identical products from the same manufacturer! Herewith, the incomplete story of "Professional T4 Lenses". Let's get this out of the way immediately. Soligor and Vivitar are not the names of lens manufacturers. They are trademarks of their respective distributors. Both A.I.C. and P & B worked with several lens manufacturers through the years. 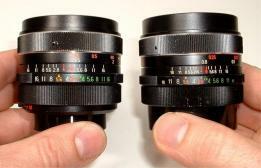 Most Soligor lenses of the late 60s and early 70s came from the company we know today as Tokina. Vivitar worked closely with Kino Precision, who later adopted the name Kiron. The Vivitar and Soligor trademarks still exist, though Allied Impex and Ponder & Best have faded away. By the mid to late 1960s, 35mm Single Lens Reflex cameras were experiencing burgeoning popularity. Accessory lenses were selling right along with the cameras. Each camera manufacturer equipped their camera with what they considered the ideal lens mount and for the most part, no two were the same. 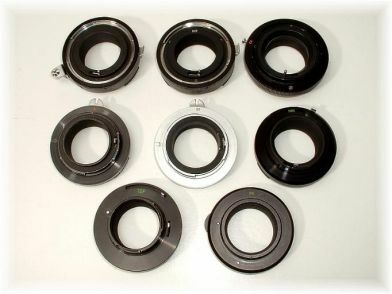 Canon, Nikon, Minolta, Miranda, Petri, Konica, Topcon all sported differing bayonet style lens mounts. The Pentax adopted the 42mm screw mount of the post war, German, Contax SLR. In that camp with Asahi were Mamiya/Sekor, Yashica, Chinon, Cosina and Ricoh. (No slight to the Germans, but I'm leaving them out for now.) For the most part, you had to buy the lenses from your camera manufacturer. Two Vivitar 28s. Identical? Don't count on it! Lens on left focuses to 18". Lens on right to 10"
Even in the 1950s, third party lenses were nothing new. Several manufacturers in Europe and Japan had produced lenses for the screw mount Leica and its' many knockoffs. 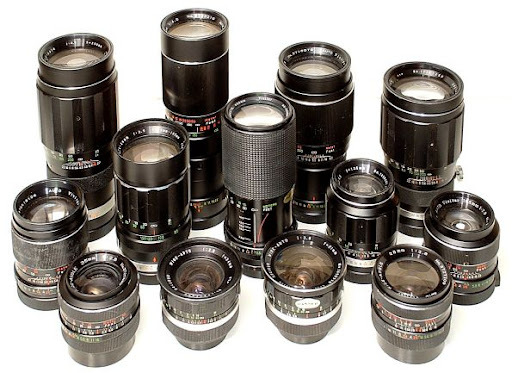 Zunow, Topcon, Konica, Komura, Fuji and others produced LTM lenses. Tamron was allegedly the first to attack this hydra with the "T" (for Tamron) mount. Screw on adapters at the rear of the lens that could fit just about any 35mm camera. The length of the adapter differed for each camera type allowing infinity focus for deep-bodied Nikons and short spaced Mirandas. A great idea, but the lenses were inconvenient to use as the aperture had to be closed manually to the desired f-number. 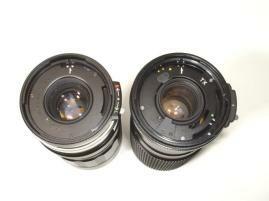 Aftermarket lens makers went to work copying each camera manufacturers mount dimensions and aperture couplings. AIC and P&B, began offering a line of automatic Soligor and Vivitar lenses fitted to the popular cameras of the day. Discontent was brewing at the camera shop, though! If a shop carried Nikon, Minolta and Ricoh cameras to cover the high, mid and low price ranges, that meant an inventory of three identical aftermarket lenses for three different cameras. I’ll bet Soligor and Vivitar loved it and the folks who made Tums were pondering their popularity with camera storeowners. The public didn’t want pre-set lenses and the stores, especially the small shops, didn’t want to tie up a bunch of cash in inventory. Why not invent an automatic diaphragm version of the T/T2 mount? Once again, Tamron was on the case early. By the late 60s they had developed the “Adapt A Matic” interchangeable mount system. It worked, but the lenses were a bit clunky and the adapters clumsy. Sigma also developed an interchangeable mount system. Neither had the advertising or distribution of the Soligor or Vivitar brands but Allied Impex and Ponder & Best didn’t want to be left behind! Adapt-A-Mania! Top, left to right: Miranda Sensorex, Miranda Sensomat, Canon FL. Middle: Nikon F, Nikon F - silver, Minolta MC. Bottom: Topcon RE, M-42 screw mount. The folks who made the Soligor brand lenses were in the hunt. Tokina designed their own interchangeable mount system and in a fit of originality named it “T4”. Why not T3 or something else, I don’t know yet. Clearly, they had noticed the weaknesses of the Tamron Adapt A Matic and improved on it. The rear of the lens was a recessed flat surface surrounded by a Canonesque locking ring. The flat faced adapter with one or two protruding pins, was aligned to the mating marks, dropped into the lens and secured in place with the locking ring. A ratchet mechanism prevented the locking ring from working loose. The lenses were very well engineered and manufactured. Not up to the level set by Nikon or Canon, but certainly the equal of offerings from Mamiya, Yashica and Miranda. Nearly every, reasonably popular, 35mm SLR was supported by a T4 adapter, including Leica and Petri. Adapters for Minolta and Topcon coupled to the camera’s meter and keyed the lens’ maximum aperture. Miranda and Nikon adapters featured appropriate protuberances for external coupling. Exakta adapters possessed the traditional shutter release activated auto-diaphragm. Canon and Pentax had only the required stop down pin. I’ve never seen the Leicaflex adapter, but assume it had the appropriate Diesel powered, chain drive, overhead cam mechanism with all its’ attendant complexities. Allied Impex was, likely, overjoyed to have such a solid, well made, system to sell to its’ dealers. The dealers were, likely, enthusiastic about being able to stock one lens and several inexpensive adapters to fit a multitude of cameras. Tamron looked at it and, likely, said “Oh Sh*t! We’ll have to go back and design something better”. Ponder & Best was, likely, feeling left out in the cold. Why didn’t P&B have Kino develop a competing system? I don’t know yet. Time to develop and get to market was probably one consideration. Legal complications may have been another. Komura, Sigma, Tamron and Tokina all had patents in place or pending. A workaround would take time. P&B would have to get a competing product on the market quickly. Somehow or another, the folks at Ponder & Best and Tokina got together. Perhaps there was a loophole in AIC’s contract or no clause that would prevent Tokina from building for another distributor. Whatever happened, Soligor and Vivitar hit the US market with nearly identical products bearing essentially the same name at virtually the same time. Go figure! If you look through a few copies of Modern Photography and Popular Photography from the early 70s, you’ll see both brands listed in the ads of the big mail-order stores. Focal length/aperture specs were identical for both brands. Prices were within a few dollars of each other. 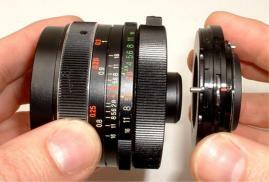 Mating faces of adapter and lens. Adapter pin is aligned with arrow as is coupling in lens. The lock ring is in the open position, ready to receive the adapter. 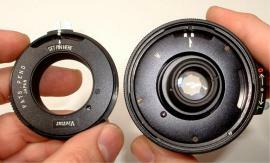 Adapter is inserted into the rear of the lens. A little wiggle may be required to mate properly. Twist the lock ring clockwise to lock them together. The lenses wore different styling on their focus and aperture rings. Soligors featured skip knurled focus rings and chrome aperture rings with tabs. Vivitars sported fully knurled focus grips and plain, black, aperture rings.. The lenses operate smoothly and the aperture mechanisms seem trouble free. From wide to long, the T4 lineup went like this: 21/3.8, 24/2.8, 28/2.8, 35/2.8, 105/2.8, 135/3.5, 135/2.8, 200/3.5, 250/4.5, 300/5.5, 400/6.3. Two zooms were offered initially, 55-135/3.5 and 90-230/4.5. A 75-260/4.5 joined the group later. A 14-lens line-up that covered 10 fixed focal lengths and zoomed from normal to 5X. Filter sizes ran the range from 49 to 67mm. Image quality I’ll regard as very adequate for the prime lenses and typical of the time for the zooms. 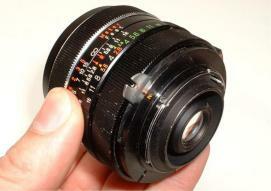 T4 lenses were quite popular in the 70s and are common on the used market today. 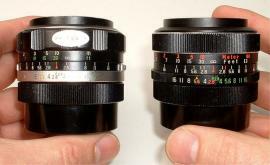 The 28, 35 and 135 lenses are very common. A notch less common is the 200 and 300. 24 and 105 seem unusual, the 21 uncommon and the 250 downright rare. I classify the 400 with the 24 and 105 in availability but it brings much higher bids in online auctions. For the zooms, the 90-230 is ubiquitous with the 55-135 and 75-260 fairly common. Adapters supported Canon FL, Minolta MC, Topcon RE, Olympus OM, Leicaflex SL, Petri, Exakta, Nikon F and M-42 screw mount. There were two adapters for Miranda. One adapter for F, G and Sensomat models and a second for Automex and Sensorex. A Konica Autoreflex adapter was available but it did not allow auto-exposure operation. This 28mm T4 lens is ready to mount to a pre-AI Nikon or Nikkormat. A quick change of adapters will mate this lens to many popular 35mm SLRs of the 60s & 70s. The Konica issue was T4’s notable weakness, but as I alluded above, camera manufacturers weren’t standing still. Hot on the heels of T4’s introduction came Canon FD, and Pentax ES. Mamiya, Fujica and Olympus also developed screwmount cameras with full aperture metering systems, none compatible with Pentax or each other. Miranda and Petri made modifications to accommodate auto-exposure systems similar to Konica’s. Not far behind followed Minolta MD and Nikon AI. By 1973, T4 was obsolete. The cure for obsolescence came in 1974. It was called TX and only came from Vivitar, but that’s a story for another time. T4 and TX side by side. Most T4 adapters will work with TX lenses. TX adapters generally don't work on T4 lenses. A clever repairer may be able to change that! Who Made That Vivitar Lens? Stephen Gandy's CameraQuest article on decoding serial numbers.